Poland is fighting for human rights violated by the mandatory vaccination! – Ogólnopolskie Stowarzyszenie Wiedzy o Szczepieniach "STOP NOP"
On the 3rd of June, 2017, approximately ten thousand Polish people – adults and children – were protesting on the streets of Warsaw against inhumane treatment and mandatory vaccinations. The turnout exceeded all expectations, only a few hundreds people were expected to attend. 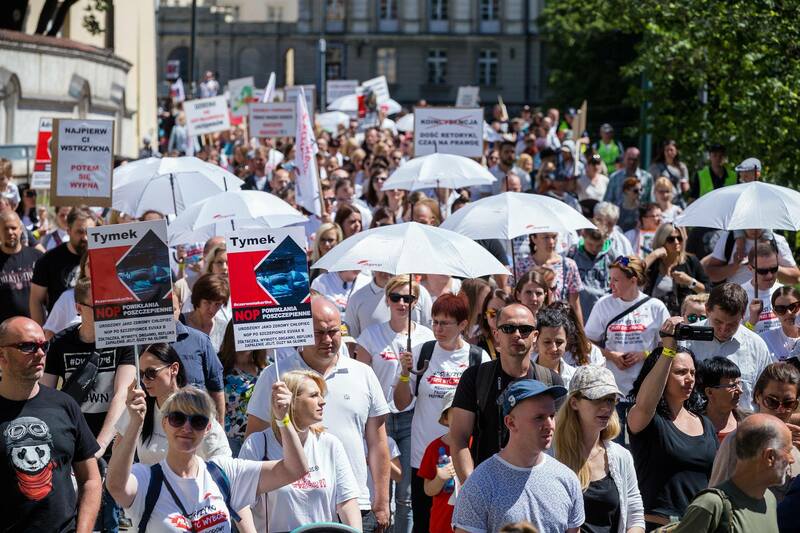 Families from all over Poland demanded the end of coercion, claiming their rights as a family, pointing to ignoring post-vaccinal complications and the uncontrolled impact of the pharmaceutical industry on the health system. There was much indignation, but also great hope, when everyone realized how many of us overcame our fear and went out into the street expressing our opposition to the vaccination terror. – Where is the media? Enough lies! – thousands screamed. Unfortunately, the mainstream media didn’t report the march, although TVP Info (public television) reporters were spotted doing interviews with protesters . These are the words of the Prime Minister Beata Szydlo, uttered in her first speech after her victorious election. She also talked about how important the development of Polish families is. She asserted that the government puts on pro-family and pro-natalist policies to break the demographic collapse. She emphasized that the government’s new social policies are described in two key words: family and justice. – 1,5 years after the promises od the Prime Minister , on June 3rd, 2017 we all said “Enough is enough”! Almost ten thousands Polish mothers, fathers, grandmothers and grandparents with children and grandchildren gathered together in front of the Ministry of Health in Warsaw. These people were protesting against the mandatory vaccination of newborns, infants and children in Poland. They came from all over Poland to demonstrate their disappointment, sadness, anger and disagreement with inhumane treatment and cruelty towards Polish families,and Polish children from contractors involved in coercion. This is the latest news from Poland! A doctor ordered to vaccinate a child who had a weakened immune system after a series of illnesses, as a result the child suffered severe complications. Parents complained to the Ministry of Health and other health authorities because the doctor had ignored his duty and hadn’t reported any adverse reactions. Instead, parents had to give explanations to the police officers because of the medical facility’s and doctor’s incompetence and negligence … They were reported to the prosecutor’s office for refusing to vaccinate another child in fear of complications. The reason for the petition was the request for the inspection over the impact of the pharmaceutical industry on the Minister’s of Health policies. Posted in Aktualności, Inne and tagged child, children, dziecko, mandatory vaccination, medical freedom, powikłania poszczepienne, protest stop nop, przymus szczepień, revolution for choice, stop nop, szczepienia, vaccines.